For more than two decades, Ray Troll has been luring, hooking, and landing fans around the world with his zany, irreverent, and often surreal art. Featured in museums, galleries, and books, as well as on immensely popular T-shirts, his work—part natural history adventure and part underground comic—depicts beautiful and accurately drawn fish of all kinds, Northwest Coast totems, Freud and Darwin, fossils, resurrections of extinct animals, and much more. 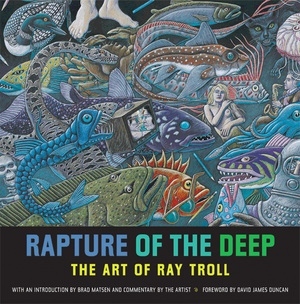 Rapture of the Deep collects some of Troll's best-known art along with many images never before published. The book makes powerful connections between biological diversity, the evolution of life on earth, and the careless habits of people. 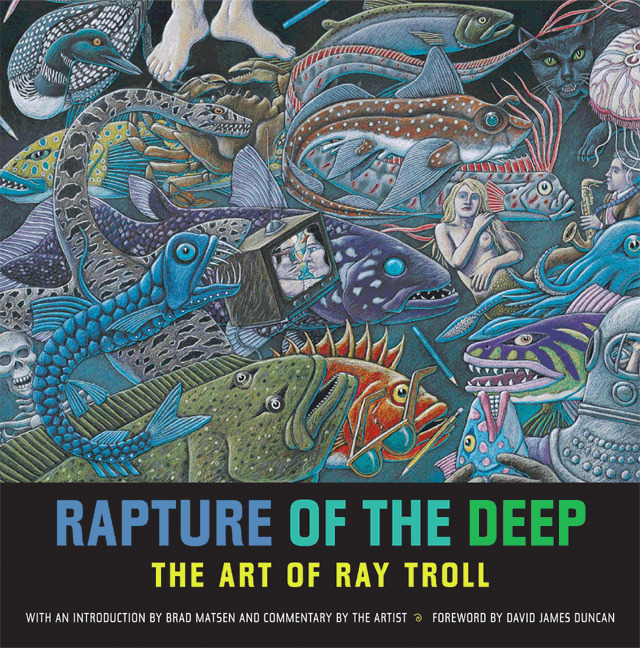 Rapture of the Deep celebrates Troll's vision with legendary works including "Spawn Till You Die," "Life's a Fish and Then You Fry," and "Bassackwards," in which fish use money, liquor, and literature as bait to lure humans. Troll's running commentary reveals the thought and inspiration behind his art. Writer Brad Matsen, Troll's longtime coconspirator, adds a lively introduction to the art and life of his "sole" brother. Ray Troll's art has been featured on the Discovery Channel, in dozens of magazines and newspapers, and in galleries and museums such as the Denver Museum of Nature and Science and the California Academy of Sciences. He has created and illustrated several best-selling books, including Sharkabet: A Sea of Sharks from A to Z (2002); Life's a Fish and Then You Fry, a cookbook by Randy Bayliss (2002); and, with Brad Matsen, Raptors, Fossils, Fins and Fangs (1995); Planet Ocean: A Story of Life, the Sea, and Dancing to the Fossil Record (1994); and Ray Troll's Shocking Fish Tales (1993). His next book, Cruisin’ the Fossil Freeway, with text by paleontologist Kirk Johnson, will be published in 2005. He lives in Ketchikan, Alaska. Brad Matsen is an author, documentary screenwriter, and photographer whose books include Incredible Deep-Sea Adventures (2003); The Shape of Life (2002); Fishing Up North: Stories of Luck and Loss in Alaskan Waters (1998); and his three previous collaborations with Ray Troll. He lives in Seattle and New York.